Vaginal apical suspension is essential for the surgical treatment of pelvic organ prolapse (POP). We aim to evaluate whether the method of apical repair is associated with different re-operation rates for POP recurrence or surgical complications. Population-based, retrospective cohort study of all Ontario women receiving primary apical POP repairs from 2003 to 2015. Primary exposure was the method of apical POP repair. Primary outcome was re-operation for recurrent POP, and secondary outcomes were surgical procedures for genito-intestinal (GI) or genitourinary (GU) complications, fistula repair, and mesh revision or removal. Forty-three thousand four hundred fifty-eight women were included. Overall, the number of mesh-based apical repairs decreased over time, while the number of native-tissue repairs slightly increased (p < 0.001). Multivariable Cox proportional hazards (Cox PH) analysis demonstrated a significant increase in repeat POP operations for transvaginal mesh apical repairs (adjusted HR 1.28 [95% CI: 1.10–1.48]), but not in abdominal mesh repairs (adjusted HR 0.96 [95% CI: 0.81–1.13]) compared with vaginal native tissue apical repairs. Overall risk of repeat surgery for fistulas or GI and GU complications remained low (< 0.5%). 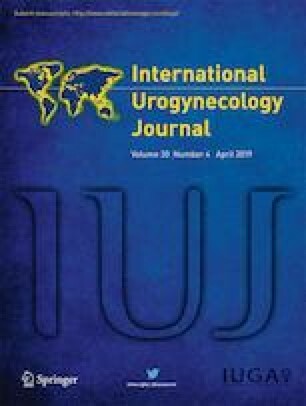 Risk of mesh removal or revision was 11.5–11.9%, with no difference between abdominal versus vaginal mesh on multivariable analysis (adjusted HR 0.99 [95% CI: 0.78–1.26]). Re-operation for recurrent POP is highest in transvaginal mesh apical repairs; however, this risk did not differ between abdominal mesh and vaginal native tissue apical repairs. GI and GU re-operations are rare. There is no difference in mesh removal or revision rates between abdominal and vaginal mesh repairs. The online version of this article ( https://doi.org/10.1007/s00192-018-3792-2) contains supplementary material, which is available to authorized users. The opinions, results and conclusions are those of the authors and are independent from the funding sources. No endorsement by the LHSC Women’s Development Council, ICES, AMOSO, SSMD, LHRI or MOHLTC is intended or should be inferred. This research project was conducted in collaboration with members of the ICES Kidney, Dialysis and Transplantation team, at the ICES Western facility, who are supported by a grant from the Canadian Institutes of Health Research (CIHR). Parts of this material are based on data and/or information compiled and provided by CIHI. However, the analyses, conclusions, opinions and statements expressed in the material are those of the author(s) and not necessarily those of CIHI. This study was funded by the Women’s Development Council at London Health Sciences Centre (LHSC), London Ontario, Canada. The Women’s Development Council is funded in part by donors of the London Health Sciences Foundation (LHSF) and by the Department of Obstetrics and Gynecology at LHSC. This study was supported by the Institute for Clinical Evaluative Sciences (ICES) Western site, which is funded by an annual grant from the Ontario Ministry of Health and Long-Term Care (MOHLTC). Core funding for ICES Western is provided by the Academic Medical Organization of Southwestern Ontario (AMOSO), the Schulich School of Medicine and Dentistry (SSMD), Western University and the Lawson Health Research Institute (LHRI).